Public debates over federal immigration reform often suffer from insufficient and inaccurate information about the tax contributions of undocumented immigrants particularly at the state level. The truth is that undocumented immigrants living in the United States pay billions of dollars each year in state and local taxes. Further, these tax contributions would increase significantly if all undocumented immigrants currently living in the United States were granted a pathway to citizenship as part of a comprehensive immigration reform. Accurate information about the tax contributions of undocumented immigrants is needed now more than ever. Congress has yet to pass comprehensive immigration reform legislation. President Obama took executive action in 2012 and announced his intention to take action in 2014 to grant relief to eligible individuals who came to the United States as children (DACA) and to eligible parents of children who are citizens or lawful permanent residents (DAPA). The 2014 executive actions are facing review by the Supreme Court in the spring of 2016. And immigration is a leading issue among the 2016 presidential candidates. • Undocumented immigrants contribute significantly to state and local taxes, collectively paying an estimated $11.64 billion a year. (2) Contributions range from almost $2.2 million in Montana with an estimated undocumented population of 4,000 to more than $3.1 billion in California, home to more than 3 million undocumented immigrants. • Granting legal status to all undocumented immigrants in the United States as part of a comprehensive immigration reform and allowing them to work legally would increase their state and local tax contributions by an estimated $2.1 billion a year. Their nationwide effective state and local tax rate would increase to 8.6 percent. • The state and local tax contributions of the undocumented immigrants who could be directly impacted by President Obama’s 2012 and 2014 executive actions would increase by an estimated $805 million a year once fully in place. The effective state and local tax rate for this population would increase from 8.1 to 8.6 percent. State and local revenue gains from the executive actions are smaller than gains from granting legal status to all undocumented immigrants because the actions (if upheld) would only affect around 46 percent of the undocumented population and the actions do not grant a full pathway to lawful permanent residence or citizenship. Collectively, undocumented immigrants in the United States pay an estimated total of $11.64 billion in state and local taxes a year (see Table 1 for state-by-state estimates). This includes more than $6.9 billion in sales and excise taxes, $3.6 billion in property taxes, and just under $1.1 billion in personal income taxes. Creating a pathway to citizenship for the 11 million undocumented immigrants living in the United States and allowing them to work here legally would boost their current state and local tax contributions by more than $2.1 billion a year (See Table 1). Personal income tax collections would increase by more than $1 billion a year. Sales and excise taxes would increase by $695 million, and property taxes would grow by $360 million. As a result, the overall state and local taxes paid by undocumented immigrants as a share of their income would increase from 8 percent to 8.6 percent. The most significant revenue gain (50 percent) would come from the personal income tax, due to both increased earnings and full compliance with the tax code. (6) Multiple studies have shown that legal immigrants have higher wages than undocumented immigrants, thus gaining legal status could lead to a boost in wages. The wage boost is in part due to better job opportunities that would be made available to workers with legal status and also in part to an increase in higher-level skills and better training. Most comprehensive reform measures to date have included strong incentives or requirements for undocumented immigrants granted legal status to fully comply with tax law. 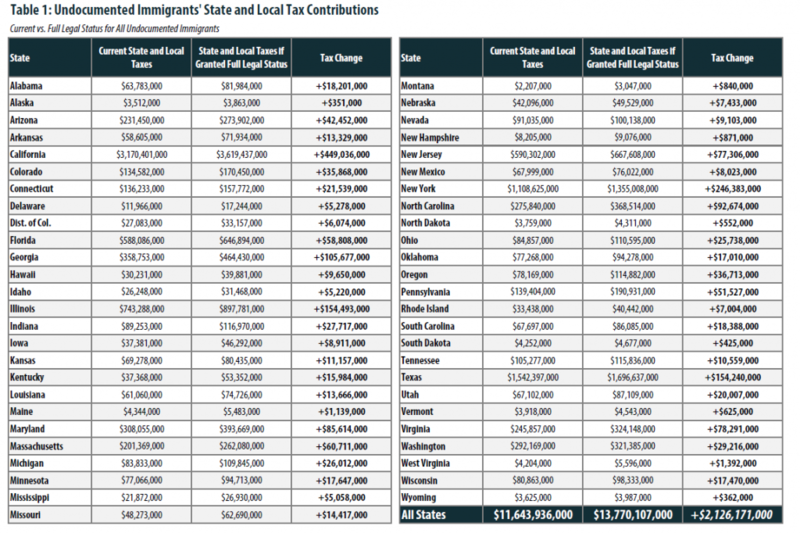 See Appendix 1 for state-by-state estimates of the current and post-reform state and local tax contributions of the total undocumented immigrant population. The appendix includes effective tax rates and totals for personal income, property, and sales and excise taxes. President Obama took executive actions in 2012 and 2014 to provide temporary relief from deportation and grant work permits to eligible undocumented immigrants. Under the Deferred Action for Childhood Arrivals (DACA) program, this relief was made available to up to 1.2 million eligible undocumented immigrants who came to the country as children. Under the 2014 executive action, President Obama expanded DACA by another 275,000 undocumented immigrants and announced the Deferred Action for Parents of Americans and Lawful Permanent Residents (DAPA) program, which would allow 3.6 million eligible undocumented parents to apply for relief from deportation and for work authorization. (7) Pending Supreme Court review of the 2014 executive action, more than 5 million undocumented immigrants could benefit from these executive actions, amounting to about 46 percent of the total population of undocumented immigrants living in the United States. If fully implemented, granting temporary immigration relief to these 5 million undocumented immigrants through DACA and DAPA would boost their current state and local tax contributions by more than $805 million (See Table 2). Personal income tax collections would increase by $442 million a year. Sales and excise taxes would increase by $239 million, and property taxes would grow by $123 million. As a result, the overall state and local taxes paid by this population as a share of their income would increase from 8.1 percent to 8.6 percent. The most significant revenue gain (55 percent) would come from the personal income tax, due to both increased earnings and full compliance with the tax code. Since the undocumented immigrants who would benefit from the executive actions would be allowed to apply for a three-year renewablework permit, some amount of wage boost could be expected. Due to the mandates of the executive actions and the strong incentives undocumented immigrants have for compliance with the tax laws, it is also logical to assume full tax compliance for this impacted population (see the methodology section for more information). 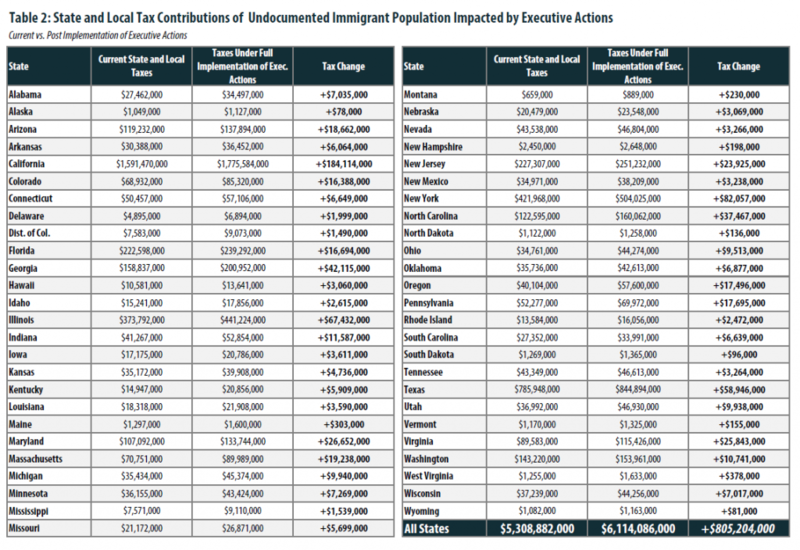 See Appendix 2 for state-by-state estimates of the current and post-reform state and local tax contributions of the 5 million undocumented immigrants directly affected by President Obama’s executive actions. The appendix includes effective tax rates and totals for personal income, property, and sales and excise taxes. While the spending and income behavior of undocumented immigrant families is not as well documented as that of US citizens, the estimates in this report represent a best approximation of the taxes families headed by undocu-mented immigrants likely pay. Additional assumptions are made (and described below) about the change in tax contributions that would occur in two instances: if all 11 million undocumented immigrants were granted legal status under comprehensive immigration reform; and if 5 million undocumented immigrants were granted temporary deferred action by President Obama’s 2012 and 2014 executive actions. See Appendix 3 for state-by-state details on data used to assist in calculating the state and local tax contributions. Estimates of each state’s impacted undocumented immigrant population under the 2012 and 2014 executive actions are from the MPI. (9) According to MPI, an estimated 5 million undocumented immigrants (46 percent of the total undocumented population) are potentially eligible to receive immigration relief under the executive actions. The Pew Research Center calculated a nationwide estimate of the number of people per undocumented immigrant family. The most recent estimate, 2.29, is used to find an estimated number of undocumented families, or taxpaying units, by state. (10) ITEP divided population estimates for each state (total and affected populations) by the average family size to find an estimated number of undocumented families/taxpaying units living in each state and the number of families/taxpaying units impacted by the 2012 and 2014 executive actions. Estimates of the income distribution of undocumented families are from MPI data on the number of undocu-mented families in five discrete income groups. (11) ITEP used the midpoint of the income ranges in each group as an estimate of average income within each group and multiplied by the number of families/taxpaying units in each group to calculate aggregate income in these groups. ITEP’s microsimulation computer model is a sophisticated program that applies the state and local tax laws in each state (including income, sales, excise and property tax laws) to a statistically valid database of tax returns to generate estimates of the effective tax rates paid by taxpayers at various income levels under state and local tax law in place as of December 31, 2014. In January of 2015, ITEP released the 5th edition of Who Pays? which estimates the effect of the state and local tax laws as of January 2015 on taxpayers at 2012 income levels. This report applies effective tax rates calculated in the 2015 Who Pays? report to the undocumented population with one exception. The effective tax rates in five states: California, Maine, Massachusetts, New Jersey, and Rhode Island were slightly modified for the analysis to include the enactment or enhancement of state EITCs in 2015 (this change applies only to the analysis post-reform for both granting legal status to all undocumented immigrants and under the executive actions and does not impact the current tax contributions). • Property tax: The first step in calculating property taxes was to identify the share of undocumented immigrant families who are homeowners or renters in each state. This analysis used state-by-state data from the MPI to estimate homeownership rates for undocumented immigrants in each state. The model assumes that for renters, half of the cost of the property tax paid initially by owners of rental properties is passed through to renters. • Income tax: Various studies have estimated between 50 and 75 percent of undocumented immigrants currently pay personal income taxes using either false social security (SSN) or individual tax identification (ITIN) numbers. (15) This analysis assumes a 50 percent compliance rate for current taxes and 100 percent post-reform (for both granting legal status to all undocumented immigrants and under the executive actions). Undocumented immigrants are currently ineligible to receive the federal Earned Income Tax Credit (EITC) and state versions of the credit because they lack the legal authority to work in the U.S. Accordingly, the impact of state EITCs has been removed from the current personal income tax estimates. This has the effect of increasing the effective income tax rates paid by these undocumented taxpayers under current law. • Wage boost: This study assumes that having the authority to work legally in the United States would increase undocumented immigrants’ wages and thus increase the taxes paid by those same immigrants, based on research by the Fiscal Policy Institute. Examining a number of studies on immigrant wages, this research consistently found that legal immigrants had higher wages than undocumented immigrants and gaining legal status could boost wages anywhere between 6 and 15 percent. (16) A Congressional Budget Office report on the economic impact of immigration reform estimated the eventual wage boost to be 12 percent. (17) An analysis from the Center for American Progress estimates that the 5 million workers who would directly benefit from the president’s action will see a wage premium of 8.5 percent. (18) This study assumes a conservative estimate of a 10 percent wage hike under granting legal status to all 11 million undocumented immigrants and a 7.5 percent wage hike under the terms of the president’s executive actions since the work status would only be temporary. An increase in income would also contribute to a slight increase in the sales, property, and income tax payments of the currently undocumented immigrant population. • Personal income tax compliance: As explained above, current estimates of undocumented immigrants’ income tax compliance rates range from 50 to 75 percent. To calculate the anticipated income tax gain from allowing undocumented immigrants to work in the U.S. legally (under full legal status or the executive actions), this analysis assumes full compliance with state personal income tax laws post-reform given the strong incentives for tax compliance likely to be included in a comprehensive reform measure. It is important to note that the same tax rules and provisions that apply to the general population will apply to undocumented immigrants filing income taxes. • Earned Income Tax Credit eligibility: Post-reform (for both granting legal status to all undocumented immigrants via comprehensive reform and under the executive actions), the study assumes that working immigrants granted the legal right to live and work in the U.S. and who are otherwise eligible for the EITC will claim the credit. This analysis also assumes that working immigrants meeting EITC eligibility criteria and granted the legal right to work under comprehensive immigration reform and the executive actions will claim the state versions of the credit. 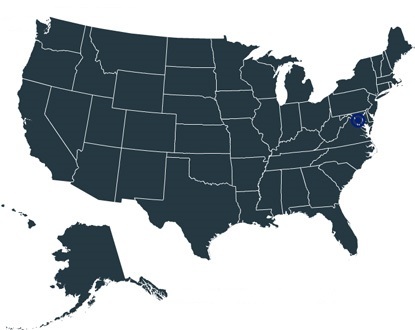 The states with permanent EITCs included in this report are: California, Colorado, Connecticut, District of Columbia, Delaware, Iowa, Illinois, Indiana, Kansas, Louisiana, Massachusetts, Maryland, Maine, Michigan, Minnesota, Nebraska, New Jersey, New Mexico, New York, Ohio, Oklahoma, Oregon, Rhode Island, Virginia, Vermont, and Wisconsin. This study includes the impact of the newly enacted EITC in California and improvements made to EITCs in Maine, Massachusetts, New Jersey, and Rhode Island since the publication of the 2015 report. The analysis presented in this report is an update to an ITEP report published in 2015. The 2016 report uses 2013 estimates on the undocumented immigrant population (size, income, homeownership, and population impacted by the executive actions) whereas the 2015 report used 2012 data. Most notably, the number of undocumented immigrants declined by more than 400,000 between 2012 and 2013, a decade-long trend that has been well documented amongst numerous researchers. The decline in the undocumented immigrant population and subsequently lower aggregate income led to a small drop in the total amount of state and local taxes undocumented immigrants pay in this study compared to the 2015 study. 1 Migration Policy Institute (MPI) analysis of U.S. Census Bureau data from the 2009-2013 ACS pooled, and the 2008 Survey of Income and Program Participa-tion (SIPP) by Colin Hammar and James Bachmeier of Temple University and Jennifer Van Hook of Pennsylvania State University, Population Research Institute. 2 See the methodology section for more information on the calculation of estimated undocumented immigrant state and local tax payments. 4 See this report’s methodology section for more information about current personal income tax compliance. 5 Institute on Taxation and Economic Policy (see footnote 3). 6 See this report’s methodology for a detailed description of wage boost and tax compliance assumptions applied to the change in state and local tax contributions post-reform. 7 Migration Policy Institute (see footnote 1). 10 Passel and Cohn, Unauthorized Immigrant Population, National and State Trends, 2010, Pew Research Center, Feb. 1, 2011. 11 Migration Policy Institute (see footnote 1). 13 Institute on Taxation and Economic Policy (see footnote 3). 14 See, for example, Manuel Orozco, Remittances to Latin America and the Caribbean: Issues and Perspectives on Development, Report Commissioned by the Organization of American States, September 2004. 15 See among others: Feinleib, Joel and David Warner, The Impact of Immigration on Social Security and the National Economy, Social Security Advisory Board, Issue Brief No. 1, December 2005 (Available at www.ssab.gov/brief-1-immigration.pdf ); Singer, Paula and Linda Dodd-Major, Identification Numbers and U.S. Government Compliance Initiatives, Tax Analysts Special Report, 2004; and Cornelius, Wayne and Jessica Lewis, Impacts of Border Enforcement on Mexican Migration: The View from Sending Communities, La Jolla, Calif.: University of California at San Diego, Center for Comparative Immigration Studies, 2007. 16 Kallick, David Dyssegaard, Three Ways Immigration Reform Would Make the Economy More Productive, Fiscal Policy Institute, June 4, 2013 (see Appendix A: A Review of the Literature on Legalization and Earnings). Available at: http://fiscalpolicy.org/wp-content/uploads/2013/06/3-ways-reform-would-improve-productivity.pdf. See also this report’s methodology section for more information on the wage effects of granting legal status to the entire undocumented population as well as the wage effects on those affected by the president’s executive actions. (1) Migration Policy Institute (MPI) analysis of U.S. Census Bureau data from the 2009-2013 ACS pooled, and the 2008 Survey of Income and Program Participation (SIPP) by Colin Hammar and James Bachmeier of Temple University and Jennifer Van Hook of Pennsylvania State University, Population Research Institute. (2) See the methodology section for more information on the calculation of estimated undocumented immigrant state and local tax payments. (4) See this report’s methodology section for more information about current personal income tax compliance. (5) Institute on Taxation and Economic Policy (see footnote 3). (6) See this report’s methodology for a detailed description of wage boost and tax compliance assumptions applied to the change in state and local tax contributions post-reform. (7) Migration Policy Institute (see footnote 1). (10) Passel and Cohn, Unauthorized Immigrant Population, National and State Trends, 2010, Pew Research Center, Feb. 1, 2011. (11) Migration Policy Institute (see footnote 1). (13) Institute on Taxation and Economic Policy (see footnote 3). (14) See, for example, Manuel Orozco, Remittances to Latin America and the Caribbean: Issues and Perspectives on Development, Report Commissioned by the Organization of American States, September 2004. (15) See among others: Feinleib, Joel and David Warner, The Impact of Immigration on Social Security and the National Economy, Social Security Advisory Board, Issue Brief No. 1, December 2005 (Available at http://www.ssab.gov/Details-Page/ArticleID/168/The-Impact-of-Immigration-on-Social-Security-and-the-National-Economy-December-2005); Singer, Paula and Linda Dodd-Major, Identification Numbers and U.S. Government Compliance Initiatives, Tax Analysts Special Report, 2004; and Cornelius, Wayne and Jessica Lewis, Impacts of Border Enforcement on Mexican Migration: The View from Sending Communities, La Jolla, Calif.: University of California at San Diego, Center for Comparative Immigration Studies, 2007. (16) Kallick, David Dyssegaard, Three Ways Immigration Reform Would Make the Economy More Productive, Fiscal Policy Institute, June 4, 2013 (see Appendix A: A Review of the Literature on Legalization and Earnings). Available at: http://fiscalpolicy.org/wp-content/uploads/2013/06/3-ways-reform-would-improve-productivity.pdf. See also this report’s methodology section for more information on the wage effects of granting legal status to the entire undocumented population as well as the wage effects on those affected by the president’s executive actions. For more indepth appendices read the pdf.